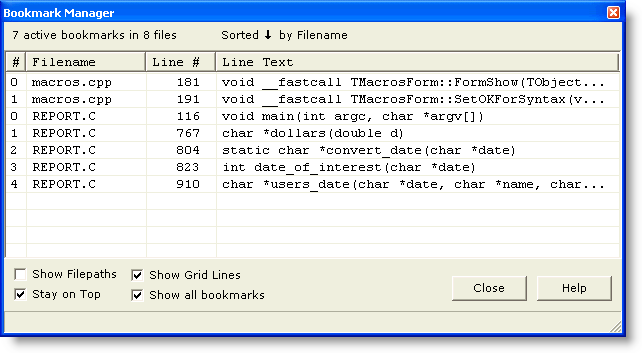 The Bookmark Manager command displays a pop-up dialog showing all bookmarked lines in the files being edited. Double clicking on an entry causes the associated file to become current, and the cursor to be placed on the bookmarked line. The display can be sorted on any of the fields by clicking on the header bar at the top of each field. Press the Delete key to remove a bookmark. The Bookmark Manager can be left open while working in Boxer, so that it's available for reference or quick navigation. Use this option to control whether filenames or full filepaths are displayed for each bookmark entry. This checkbox controls whether or not the dialog will remain on top of other windows. Use this option to toggle on/off the display of grid lines within the view. This checkbox can be used to control whether bookmarks are displayed for all open files, or for only the current file.